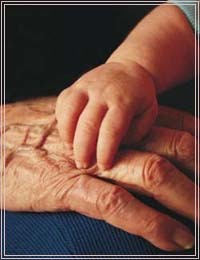 Inter-Generations and Intergens is produced by Geriatric Consultation Services (Theodore James Hardgrove). The style, format and information provided by Inter-Generations is for public use and Theodore Hardgrove is in no way liable for any harm or damages which arise from the use of resources provided and the referrals which may come from the directory usage. The design of the directory which makes up Inter-Generations may in no means be recreated on the Internet without the expressed written consent of the producer. Every effort is made to ensure that any terms defined or information printed in Inter-Generations is credited to the original author or sponsoring organization. A bibliography is available upon request. To inquire about the creation of the directory or learn more about how to contribute by providing original material which could enhance the directory as an educational resource email intergens@cox.net for more information.